I found this little bag of vintage lace at the thrift store last week, and it is for sure going to be integrated into some of what I am doing in my studio. I can't wait. A lot of it is yellowed from the sun, but for me, it just makes it even prettier. I think I am going to tack some on to the top of one of my pairs of boots, or maybe on the pockets of one of my coats. All of this wonderful lace for $1! I'm also chugging away on my Francis sweater. It helps that it is all plain knit stitch, it is excellent for mindless knitting. I love the color of this yarn too. It is a light mossy green (cascade 220) and it is the same color of a sweater of mine that I had for years. The sweater eventually got shrunk in the dryer, so this is its 'replacement' of sorts. It will have a cowl neck and 3/4 length sleeves when I am finished. oh wow, I'm ridiculously jealous of that awesome bag of lace you picked up!! 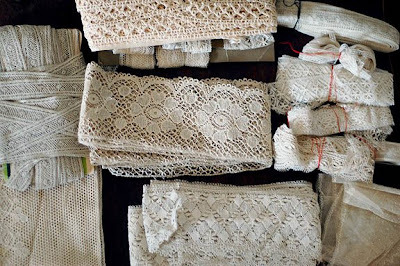 I'm going to start scouring more thrift shops, if lace goodies like that are available. Wow! Great find! Beautiful lace! 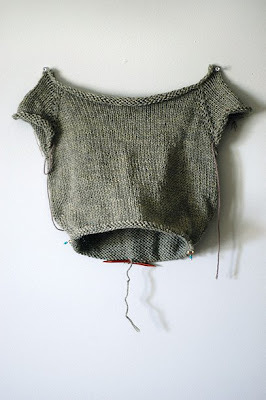 And great shot of the sweater-in-progress! Lovely.